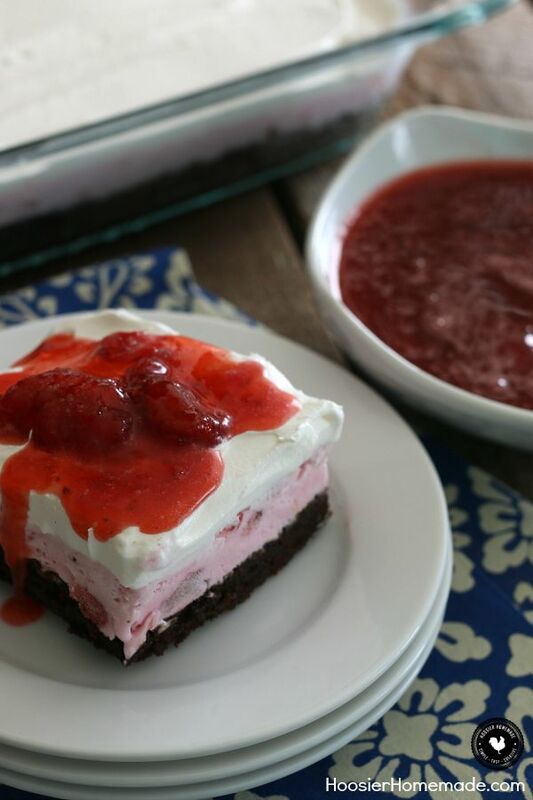 Layers of brownie, strawberry ice cream, whipped topping and topped with homemade fruit topping will put a smile on your face! 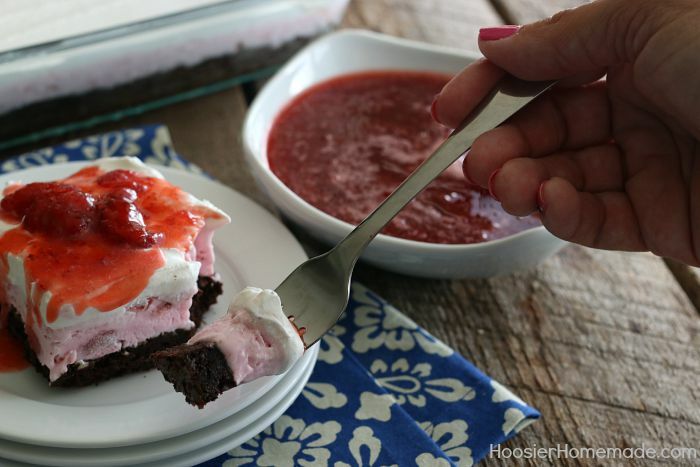 This Neapolitan Brownie Ice Cream Cake is easy to make with just a few ingredients! Neapolitan – chocolate, strawberry and vanilla – most commonly seen in Ice Cream, layered together in the same container, has become one of the most popular desserts as well. The flavors together are one of my favorites. When I am creating desserts, I often forget how much I love this flavor combination. Another place for great recipe ideas is Wild Oats Instagram, be sure to follow them for delicious, healthy recipes. Today we are taking the Neapolitan flavors and kicking them up a notch. 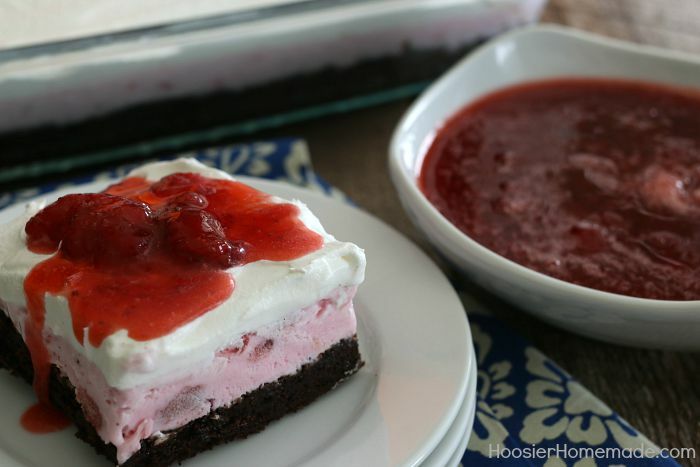 This Ice Cream Cake is super easy to make, but has amazing flavor. We have added homemade fruit topping that also takes just a few ingredients. I remember growing up, my Mom would often serve Neapolitan Ice Cream for dessert. It was really popular in the 1970’s. This Ice Cream Cake takes me back to that time. The bottom layer is brownie, I used a box mix that calls for a square pan, but to get a thinner layer of brownie, I baked it in a 13×9. Be sure to under bake the brownies a bit, because they do get hard while in the freezer. The middle layer is Strawberry Ice Cream. We actually bought 2 different kinds. After getting the first one home, we discovered it wasn’t really pink and bright colored, it was more muted. So we ended up going with Edy’s Ice Cream. Then the top layer is whipped topping, you could also use whipping cream or vanilla ice cream if you like. 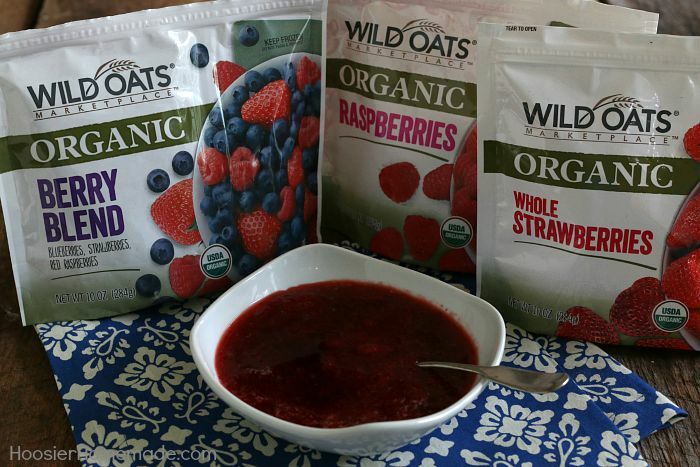 For the Fruit Topping, we used Wild Oats Marketplace Organic Berries. They offer a wide variety of frozen fruit, this time we used the Strawberries to go with the Strawberry Ice Cream. Fruit topping is perfect for a variety of desserts, of course we love it on Ice Cream, but you can use it on Cheesecake, Bar Cookies, Cakes, and more. Making homemade fruit topping is really easy and takes minutes. You begin by cooking sugar, fruit and lemon juice in a saucepan. When you first add the ingredients and stir them it seems super thick and like it needs more liquid, but just keep stirring and it will come together. Bring mixture to a boil and cook for 3-5 minutes until the mixture is thickened. Remember it will also thicken when it cools down. Now you can either drain the mixture to have more of a syrup, or leave the berries in. I drained it, then added a couple spoons of the berries back in to give the topping a bit of texture. For more information on Wild Oats, follow them on Facebook page, Instagram, Twitter and Pinterest. 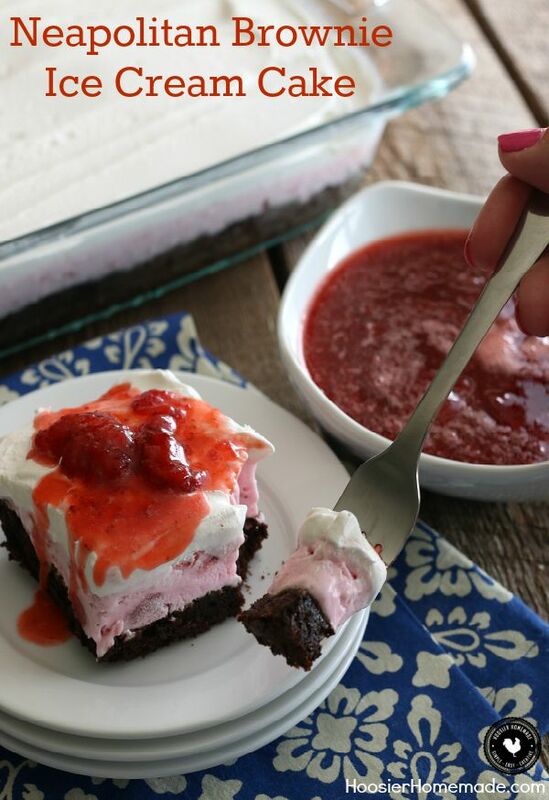 Layers of brownie, strawberry ice cream, whipped topping and topped with homemade fruit topping will put a smile on your face! Mix brownies according to box, spread in 13x9 pan. Be sure to under bake a little. Set ice cream out to soften slightly. Scoop onto brownies, run a spatula under hot water and spread ice cream evenly. To serve - remove cake from freezer about 15 minutes before serving. Use a hot knife to cut.